Sputnik Magazine was published monthly by the Soviet press agency Novosti from 1967 until 1991. Sputnik provided a digest of the Soviet press for international readers; it was available in several languages and sold in socialist and capitalist countries around the world. The magazine presented topics relating to politics, science, and culture as well as the society of the Soviet Union. Novosti wanted to promote a positive, modern image of the socialist development in the Soviet Union internationally. The magazine’s name reflects this objective as it refers to the first artificial earth satellite, which was launched by the Soviet Union in 1957. As a means of promoting socialism Soviet style, Sputnik disseminated socialist propaganda which many readers in the socialist countries dismissed as indoctrination. However, with changes in Soviet policies in the 1980s, the magazine became a source of sought-after information and discussion. When Mikhail Gorbachev became General Secretary of the Communist Party of the Soviet Union in 1985 (until 1991), he promoted the new ideals of glasnost (openness) and perestroika (restructuring) as approaches to a reformed socialism. Perestroika was a political concept (1980 -1991) within the Communist Party of the Soviet Union. In the 1980s, the economy in the USSR was crumbling, which resulted in poor living conditions, environmental problems, political disengagement, and disintegration of society. Gorbachev pursued a new approach to tackle the problems, believing that more openness in discussing problems would initiate a democratization and consequently engagement of people in much needed reforms. This included more freedom of speech and less censorship for the media and opposition groups either political or religious. These political changes were reflected in Sputnik magazine, which became a means of promoting and disseminating the new course in the Soviet Union internationally. 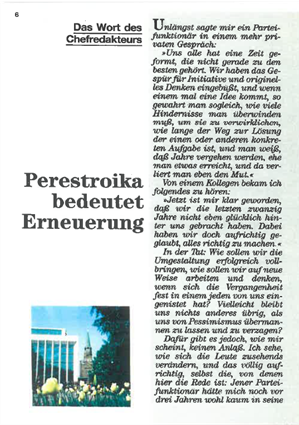 In his column, the chief editor of the magazine promotes reforms as renewal: ‘Perestroika bedeutet Erneuerung’. Initiative, original ideas, and innovative thinking were celebrated as means of a renewal from below. ‘Mehr Demokratie – Aber Wie?’ (‘More Democracy – But How?’) was the central question of the issue. The June issue from the end of the 1980s reflects the political transformation in the Soviet Union. It compiles articles critical of social, political, and economic developments and endorses non-conformity and free speech. The front cover of the issue shows a young punk, an example of openness and tolerance of individuality, in this case of a subculture. The acceptance of other groups or subcultures who did not follow ‘the socialist norm’ is here seen as a progressive step towards reform. Children are a particular focus of the issue. As symbols of a society’s future, their situation is seen to reflect the Soviet Union’s perspective. An article titled ‘Was ist aus unserer Güte geworden?’ (‘What has become of our Kindness?’) is exemplary of the criticism of society’s failures. It discusses mothers [not fathers!] who light-heartedly give their children away or leave them in state care in order to work and pursue a career or simply have an easier life. The article stresses the loneliness and sorrow of the abandoned children. Vehemently criticising the denial of a proper homes and family, the article points to a society that has become cold, careless, and disinterested in human values. East Germany (GDR) faced problems in the 1980s similar to those of the Soviet Union. Under Erich Honecker as General Secretary of the Central Committee of the Socialist Unity Party (1971-89), GDR society suffered not just rapid economic decline, but stagnated politically and disintegrated. Unlike Gorbachev, Honecker refused to implement changes and even in the face of growing protest he pleaded for communism to remain unchanged. Ironically, it was the development in the Soviet Union with Gorbachev as its icon which inspired protest in East Germany. For the first time in post-war Europe, a Soviet leader became a political star celebrated by the masses who had until then seen the Soviet Union as oppressor. For the first time, too, people queued to buy Sputnik and found it an inspiring read. As the East German leadership feared loss of control, films, books, and newspapers from the Soviet Union were for the first time in East German history banned in order to contain the call for freedom. 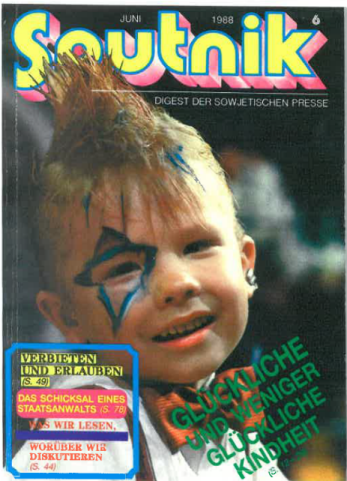 Sputnik magazine was banned on 18 November 1988; one year later, on 9 November 1989, the Berlin Wall had been brought down by popular protest and Sputnik was sold again. Welcome to blogs.reading.ac.uk. This is your first post. Edit or delete it, then start blogging!